Is the pen no longer mightier than the finger? Wacom has announced its first ever foray into the world of multi-touch, with the launch of four new products: the Bamboo, Bamboo Fun, Bamboo Pen and Bamboo Touch. Wacom tablets are usually circumnavigated with a pen, but the latest batch can also be controlled with your fingers. Not that Wacom is banishing the trusted stylus – far from it, as the company states: "Merging pen and touch technology into one device brings the best of both worlds, making it even easier, quicker and more fun to use a computer. "A gesture using two fingers enables users to simply rotate an image or document, flip through a digital photo album or presentation, scroll through a blog or an excel sheet and zoom in and out of a photo or map." While TechRadar is used to giving two-fingered gestures of a different kind, it's definitely a good move on Wacom's part to bring its Tablet range into line with the numerous multi-touch devices available in the tech market at the moment. The second-gen Bamboo range is available now and will cost you £74.99 for the Bamboo, £89.99 for the Bamboo Fun (small) and £169.99 Bamboo Fun (Medium). If you don't fancy using multi-touch, then the Bamboo Pen (pen input only) will set you back £49.99. And if you want to completely embrace multi-touch, then the Bamboo Touch (touch input only) will cost £59.99. 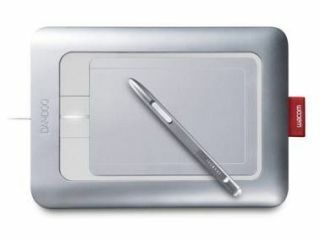 Go to www.wacom.com/bamboo for more information.